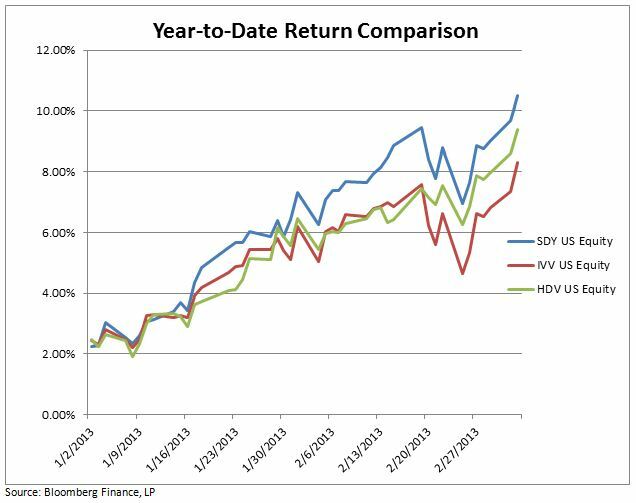 The 2012 market rally has continued into 2013, and high dividend stocks continue to generate decent gains. As the chart below shows, two major high dividend ETFs have outperformed the iShares Core S&P ETF (Ticker: IVV) so far this year. Alpha. Investopedia.com: Often considered to represent the value that a portfolio manager adds to or subtracts from a fund’s return. As the Fed continues to pursue its low-rate policy in the intermediate term, high dividend stock portfolios may be a better income alternative compared to lower yielding intermediate term treasuries. Most high dividend payers are from defensive sectors like consumer staples and utilities. They tend to be less volatile and may perform better when the market uncertainty is high. All of CLS’s proprietary mutual funds hold at least one of these high dividend ETFs. We are comfortable with these positions and will continue to hold these securities if the current market environment doesn’t change. This material does not constitute any representation as to the suitability or appropriateness of any security, financial product or instrument. There is no guarantee that invest­ment in any program or strategy discussed herein will be profitable or will not incur loss. This information is prepared for general information only. It does not have regard to the specific investment objectives, financial situation, and the particular needs of any specific person who may receive this report. Investors should seek financial advice regarding the appropriateness of investing in any security or investment strategy discussed or recommended in this report and should understand that statements regarding future prospects may not be realized. Investors should note that security values may fluctuate and that each security’s price or value may rise or fall. Accordingly, investors may receive back less than originally invested. Past performance is not a guide to future performance.